Tweet Login or create an account to earn Points for sharing! You will earn 60 Points for purchasing this product. Green Tea has become a benchmark antioxidant based on its high concentrations of polyphenols, a powerful class of bioflavonoids that have been surmised to greatly assist in the destruction of oxidation forming free radicals. Although it's commonly used in teas, aromatherapy and tinctures, the highest concentrations can be found in capsule form. 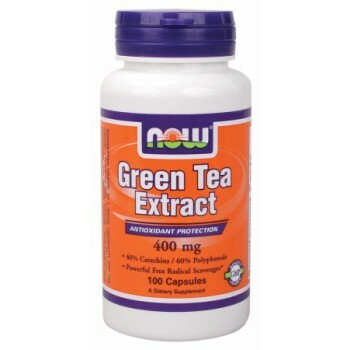 NOW Green Tea extract is standardized to 40% catechins to provide maximum benefits. Green Tea Extract naturally containing the polyphenol EGCg (epigallocatechin gallate), a catechin flavonoid (bioflavonoid), may support weight management, primarily by increasing energy expenditure. A randomized double-blind, controlled parallel multicenter trial consisting of a 2-week run-in period and a 12-week treatment period tested Green Tea Extract's mechanisms of action. Healthy young men who took green tea containing a total of 150 mg caffeine and 270 mg EGCg per day in divided doses burned more calories and fat than those who took only 150 mg caffeine daily. A placebo containing no caffeine or EGCg did not improve metabolism. Although caffeine does stimulate metabolism, obviously other substances in the Green Tea Extract were responsible for some of that metabolism-boosting effect. Contains No: Salt, Yeast, Sugar, Corn, Wheat, Gluten, Milk Or Preservatives. © 2010 - 2017 Evolv Supplements. All Rights Reserved.